LG's indisputably beautiful 55-inch OLED TV will arrive in the second half of this year, the Korean manufacturer has confirmed. 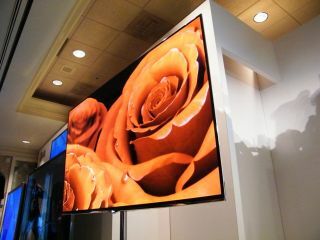 The pencil-thin Smart TV-enabled set wowed the masses of onlookers and indeed TechRadar at CES 2012 in Las Vegas earlier this month. While LG had been coy about when the Cinema 3D telly would land in homes, reports this week suggested the company may be going into production in July. Pressed for comment by TheVerge LG said that although "it's really difficult to predict exactly when" that 55-inch beasts "will start rolling out sometime in the second half of 2012." The arrival of LG's 55-inch OLED TV at CES proved a breakthrough for the technology which has threatened to eventually eclipse LCD for the last few years. Until CES, where Samsung also launched a living room-sized OLED display, the sets on offer had been far too small to be considered the number one viewing device in the home. In the meantime, check out our 55-inch LG OLED TV hands-on.